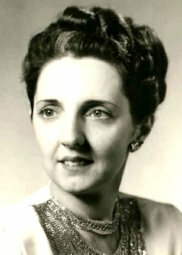 Helen Marguerite Bickley was born November 19, 1917 in Farley, Iowa: the daughter of Jesse and Arabelle (Roehrig) Pixley. She graduated from Dubuque Senior High School with the class of 1935. Following graduation, Helen moved to Waterloo where she worked for Dr. Carl Bickley until 1942, as an Office Assistant. Helen then worked as an Assistant Bookkeeper at New York Fashions until 1945. She was united in marriage to Major Donald W. Bickley, MD, in Trinidad, Colorado; he preceded her in death on January 12, 2005. Helen and Donald returned to Waterloo where they worked side by side until his retirement. Helen passed away at her home on Thursday, April 16, 2015 from natural causes at the age of 97. She is preceded in death by her parents and her husband, Dr. Donald. Helen is survived by two sons: Carl (Deanna) Bickley of Denver, Colorado and Dr. Mark (Suzanne) Bickley of Waterloo; a daughter Kit (Gary) Carpenter of Waterloo; six grandchildren: Jennifer (Todd) Kelly, Charlton (Renee) Carpenter, Amy (Andrew) Manning, Kami (Douglas) Langenberg, Adrian (Michelle) Bickley and Gayle Bickley and ten great-grandchildren: Austin, Alec, Madeline, Isabella, Cade, Sophie, Ember, Brandon, Oliver and Henry. Helen will be greatly missed by all who knew her. Memorials may be directed to American Cancer Society of Black Hawk County, 2709 University Ave, Waterloo, IA 50701.